Just beneath one of Bangkok’s largest shopping mall, Siam Paragon, you will find SEA LIFE Bangkok Ocean World. Formerly known as Siam Ocean World, this aquarium is one of the world’s largest! There are over 400 aquatic species and 30,000 sea creatures on display. The recommended time to spend in the aquarium is 2 hours but you’re free to explore the wonderful and mysterious sea life as long as you wish. From dangerous sharks to adorable otters and multiple interactive installations, SEA LIFE Bangkok is suitable for adults and kids of all ages. SEA LIFE Bangkok Ocean World is open daily from 10am to 9pm, including public holidays. The last call for tickets is at 8pm. The recommended time to spend in the aquarium is 90 - 120 minutes, so the latest you should enter the attraction is at 7pm - 7.30pm. To get to SEA LIFE Bangkok Ocean World, first make your way to Siam Paragon. You can get to the mall via the BTS. Stop at BTS Siam Station and take the Exit 5 which will provide direct access to Siam Paragon. SEA LIFE Bangkok Ocean World is located at floor B1 & B2 of Siam Paragon. You should be able to locate the entrance once you take the escalator down to the aquarium. There are several ways you can purchase SEA LIFE Bangkok tickets. For non-Thai nationals, the most convenient and hassle-free way you can get your SEA LIFE Bangkok ticket is from Klook for 45% off the retail price! Do note you will need to redeem your Klook voucher for a physical ticket to gain entry into the aquarium. Alternatively, you can also purchase the direct entry ticket. Keep reading to find out how. The queue to redeem for physical tickets in SEA LIFE Bangkok can get pretty long (30 - 60 mins waiting time), especially during peak seasons. To avoid all the hassle, you can opt for the SEA LIFE Bangkok Ocean World Direct Entry Ticket (BKK Airport Pick Up). Simply flash the Klook e-voucher and redeem your open-dated physical ticket in Suvarnabhumi (BKK) Airport. The Klook counter is located on B Floor, RC6 (next to Airport Rail-Link Station). During booking on Klook, make sure to select the date you intend to redeem at the airport! It's a much quicker redemption process and you'll be able to enter the aquarium directly without queueing. This is a Klook exclusive perk, so best to make full use of it! For mums and dads with children, SEA LIFE Bangkok Ocean World is the perfect place for the family. Upon entering, the kids will be given free ‘snorkeling masks’ to make their experience even more exciting. There are also numerous kid-friendly activities to keep the little ones engaged and interested. From game boards to dive log books for the kids to complete, displays with fun facts for them to interact with, colouring sheets and a play area, you won’t have to worry at all about your child getting bored in the aquarium! There’s also a mini ocean tunnel that’s made for a tiny human to fit through. How cute is that! You’re free to explore SEA LIFE Bangkok Ocean World however you like! However, to help you navigate inside the aquarium, you can follow this handy guide for the best experience. To dip your toes into the underwater world, begin with taking a look at the giant spider crab and giant pacific octopus. It can be quite the hide-and-seek adventure with these sea creatures thanks to their camouflage abilities! Now comes the thrilling part - the Shark Walk! Just beneath your feet is a transparent acrylic sheet that separates you from 5 different types of sharks in the tank. A few of the species you’d find are Sand Tiger Shark, Leopard Shark and Blacktip Reef Shark. Not only heart-thumping, the Shark Walk also presents lots of cool fun facts on their large interactive screens. After that thrilling walk, it’s time to take it down a notch at the Coral Reef zone. Be dazzled by the colourful and vibrant displays of corals and fishes. If you were a mermaid or a merman, this is the underwater life you’d want! As the name of the tour suggest, you can uncover the secrets of the ins and outs of SEA LIFE Bangkok Ocean World. Get hands-on experience on how they care for the sea creatures at the "Aquatic Quarantine and Nursery Centre". Do note that this tour requires a separate fee and does not come with your admission ticket. However, you can get it with the Super Combo from Klook! Welcome to the world of seahorses! Learn and observe how they live, breed and fit in the underwater ecosystem. At Seahorse Kingdom, you can find big belly seahorse and alligator pipefish. Next up, it’s time for a walk through the Tropical Rainforest zone for a short break from the ocean world. Try and spot the many frogs camouflaging with the environments or try not to squeal at the utterly adorable otters. You’ll be seeing stars here, sea stars or starfishes that is! There’s a dedication section for you to touch the sea stars and sea slugs as well. For kids, this place is an underwater playground for them with the aquariums, Pop Up Tank, Crawl Through Tank, and Secret Cave Tank. Don’t be surprised to see even the adults popping their heads in or squeezing through those fun displays and tanks! In Rocky Shore, you can watch the stingrays swim through the water. Did you know it’s so beautiful that it’s inspiring potentially the next generation of submarines? Besides the elegant stingrays, you can also see the cute African penguins during. Make sure you come during the penguin feeding times! A new addition to the aquarium in 2017, this art exhibition zone is inspired by camouflage abilities of the sea creatures! Designed to follow patterns of starfish, lionfish, and yellow boxfish, it’s an explosion of vibrant colours in there. A ticket fee is required to enter this art zone priced at THB990 for adults and THB790 for children. It’s definitely well worth it for all the cool Instagram shots you’ll be able to take! You’ve now come to the 8-metre-high aquarium where you’re greet with a panoramic view of the wonderful corals and fishes of the underwater world. It almost feels like you’re actually in the depths of the oceans with those sea creatures! All around, you’ll find information boards to learn more about the ocean world as well as the importance of marine preservation efforts. One of the major highlights of SEA LIFE Bangkok, this spectacular Ocean Tunnel is surrounded by sharks, eagle rays, and more fishes than you can ever identify! Watch in awe as sharks swim by while standing no more than a few metres away. You’ll also find your attention drawn to a display of famous mythical Thai icon amongst the sea life. Take a dive into the deep ocean in this manmade shipwreck. Feel the adrenaline of danger lurking around as the sharks swim amongst the other fishes around the shipwreck. You won’t be able to look away! The excitement then continues with the showcase of the colourful jellyfish. In the deep, dark depths of the ocean, the bright glow of these creatures help them stand out. You can find Moon Jellies and Upside Down Jellies here in their mesmerising state. Before ending your exploration at SEA LIFE Bangkok, stop by and say hi to the adorable-as-ever Gentoo Penguins! Set in the snowy and cold environment, you can see these cute creates swimming or waddling around. With Ice Adventure being the last stop, it’s hard to leave the aquarium because of these adorable lil guys! If those close encounters with the sharks are not thrilling enough, you can take an exciting ride on the glass bottom boat. This is where you’ll get up-close-and-personal with sharks, stingrays and other fishes. A SEA LIFE staff will also be feeding the fish by hand! This will definitely be an experience you won’t forget. Make sure to purchase a Klook package that includes the glass bottom boat activity! For an experience for all your senses, the 4D cinema is more than just audio and visual. With cutting-edge technology, it’s bound to be an exhilarating time from start to end. Get your admission ticket together with 4D Cinema admission as well as other add-ons. To literally walking amongst the sea life, take part in The Ocean Walker where you’ll be fitted with a diving and swimsuit gear. Walk through the underwater tunnel where it’s safe but still exciting with unobstructed access to the mysteries of the sea life. This activity is priced at THB2,000 Baht which includes admission, swimsuit, and diving gear. For the thrill-seekers, you’ll be glad to know that you can dive with the sharks at SEA LIFE Bangkok Ocean World! Careful, don’t let them smell your fear. Come face-to-face with sand tiger sharks, blacktip reef sharks, leopard sharks, round ribbontail rays, eagle rays, and other aquatic friends. Prior diving experience is not necessary but prices do differ for various experience levels. Also not to be missed when in SEA LIFE Bangkok is the feeding time! Held at multiple times across the day daily, you can watch feeding from otters to penguins, sharks, eagle rays and fresh water fishes. You can also interact with the handlers during those feeds. Be sure to plan your visit during the SEA LIFE Bangkok feeding times. In SEA LIFE Bangkok, you can also learn more about their conservation efforts under the SEA LIFE Trust. A global effort to protect the world’s oceans, it includes protecting the marine wildlife from exploitation, awareness on sustainable seafood choices, supporting marine protected areas, eliminating pollution, and many more! Since SEA LIFE Bangkok is located in Siam Paragon, the sixth largest shopping mall in Thailand, you can continue you shopping madness! Also in the mall are restaurants, so you can tuck into delicious local cuisine after walking through the aquarium. If you’re up for more excitement, you can also head over to Madame Tussauds Bangkok. Just several minutes walk away, you’ll find Madame Tussauds Thailand, the 10th oldest branch across the world. “Meet” with President Barack Obama, Wayne Rooney, Lady Gaga, Angelina Jolie and many other celebrities. You can also meet your heroes like Superman and Wolverine! With the all-inclusive Klook package, it’s the perfect deal for a great deal of fun! Klook your tickets to SEA LIFE Bangkok Ocean World now! Offers a variety of value-for-money packages including 4D Cinema, behind the scenes tour, photo op and more! Connect with family and friends in Thailand without exorbitant roaming costs with an unlimited data SIM card. Enjoy lightning fast web speeds, get updates from your social media accounts and make hassle-free travel arrangements. Available for pick up right when you arrive at either DMK or BKK airport, staying connected has never been this easy. Make sure to start your visit to Thailand hassle free by booking a BKK airport transfer in advance. From the moment you arrive, you'll enjoy the comfort of a private vehicle with your own professional driver who will pick you up from your hotel or Bangkok Suvarnabhumi Airport arrival hall, before whisking you off to your final destination. You'll enjoy the comfort of a private vehicle with your own professional driver who will pick you up from your hotel or Bangkok Don Muang Airport arrival hall, before whisking you off to your final destination. These private transfers offer a range of pick up and drop off loactions from Don Muang International Airport to downtown Bangkok, Pattaya, Jomtien, Hua Hin, Ayutthaya, Koh Samet and Koh Chang. The Klook Guide to having the best spa or massage experience in Bangkok for all wallet sizes! From the classic Thai massage to even a Diamond treatment, get relaxed in Bangkok with Klook! 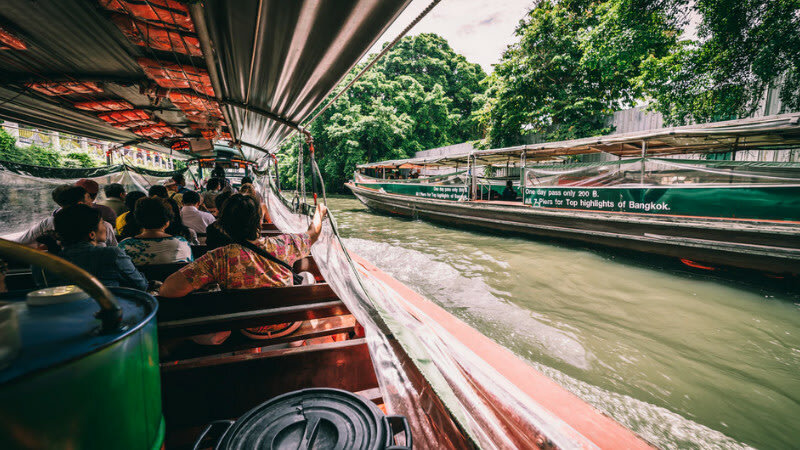 If it's your first time in Bangkok, here are a list of attractions you wouldn't want to miss! Floating markets, muay thai shows and the adorable LINE village are just some of the few. Read on to find out more! Not sure how to plan your Khao Yai itinerary or how to get there without working up a stress? Here's an itinerary with all the highlights and tour details for the most perfect trip!